EZ Glide 350 is the top of the line. 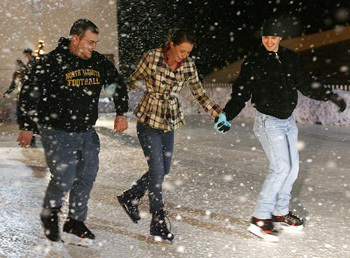 The newest and most popular synthetic ice product, it is made from a proprietary polymer compound, and is the only product available today that is specifically designed by ice skaters and engineers for a variety of successful applications. Durable enough to be used for commercial ventures such as hockey training facilities, public skating and traveling ice shows, it is also affordable enough to justify residential installations allowing at-home training like never before. It is UV stable and can be utilized indoors and out in any season. Use of EZ Glide 350 synthetic ice will enhance skating performance, allowing a skater to perform and perfect any skill or maneuver executed on refrigerated ice. Unlike other products on the market, the use of EZ Glide 350 synthetic ice will not inhibit but rather enhance skating performance, allowing a skater to perform and master any skill or maneuver executed on refrigerated ice rinks. Through numerous years of research and development, Ice Rink Engineering and Manufacturing, LLC has responded aggressively and eagerly to the shortcomings of the synthetic ice products on the market, including those we have sold since the 1960's. EZ Glide 350 synthetic ice, developed by Ice Rink Engineering and Manufacturing, is distinctive among all other synthetic ice skating surfaces. When skating on refrigerated ice one fact remains true; the more contact between a skater's blade and the ice surface, the faster the glide. This is not true of synthetic ice surfaces; the less contact between the blade and the surface, the faster the glide. With this in mind, EZ Glide 350 synthetic ice is designed with a special beaded surface which reduces friction to the blades and results in a faster, longer glide, better puck performance, and fewer blade sharpenings. This unique beading ensures skating on EZ Glide 350 synthetic ice is as pleasant and easy on day one as it is in year ten. As EZ Glide 350 is used, the beading is worn away and replaced with superficial scratches and scarring from the skate blades resulting in even faster glide potential. The more EZ Glide 350 is used, the faster it will skate. Each commercial-grade panel is comprised of EZ Glide 350 synthetic skating material throughout its entire thickness which allows for skating on both sides of the product for many years of satisfaction. Offered with a 10 year warranty, EZ Glide 350 is available in a variety of thicknesses, sizes, and connection styles to accommodate most economic considerations. All EZ Glide 350 synthetic skating surfaces are totally UV stable making them perfect for indoor or outdoor use. They are weather and warp resistant; an essential property unique to EZ Glide 350 synthetic ice panels. EZ Glide 350 synthetic ice skating surfaces and the EZ Glide Enhancer" are all environmentally friendly products. There is no waste in the manufacturing of EZ Glide surfaces. The EZ Glide Enhancer is safe, non-toxic and non-staining. EZ Glide 350 synthetic ice is offered in our exclusive "Double-Locking (DL) DoveTail" connection style which makes installation and removal very quick and simple. Use of the DL DoveTail will allow for a wide variety of installation shapes to fit specific needs; however, the most important feature of the DL DoveTail panel is that expansion and contraction are not an issue whatsoever, as the panels will not separate vertically or horizontally. The exclusive Double-Locking (DL) DoveTail creates the safest and most secure panel-to-panel connection available in the industry. EZ Glide 350 synthetic ice is also offered in Square Edge and Spline panel configurations for special applications. EZ Glide 350 has become an essential training tool for serious and advanced skaters, allowing athletes to train with a technical accuracy, which translates to an even stronger, faster, more aggressive and agile performance on refrigerated ice. Anything that can be done on refrigerated ice can be performed and perfected on EZ Glide 350 synthetic ice! EZ Glide 350 is exceedingly beneficial for every age, every skill level, every style of skating and every application indoors or out, in any kind of weather.